I know I promised more Morocco, and it’s coming, I swear! But first I’m taking a little break from writing up our trip to write about something that was waiting for me in the mail when we got back: a copy of David Lebovitz’s brand-spanking hot-off-the-press new cookbook, The Perfect Scoop. David Lebovitz hardly needs any introduction from me. He is, after all, the man behind one of the most entertaining and informative blogs out there, davidlebovitz.com. He’s also a former Chez Panisse pastry chef, the man conducting Paris’ most sought-after chocolate tours, and the author of the best-selling cookbooks Room for Dessert, Ripe for Dessert, and The Great Book of Chocolate. His fourth book, published this month, just might transcend them all. The Perfect Scoop: Ice Creams, Sorbets, Granitas, and Sweet Accompaniments is indeed chock-full of perfect scoops, in the form of simple, inventive, fool-proof recipes for frozen treats and things to put on, under or beside them, as well as plenty of engaging – oftentimes hilarious – commentary. The ice cream recipes themselves strike a perfect balance between comfort and creativity; there’s everything from plain old chocolate, vanilla and fresh strawberry to roquefort-honey, avocado, and black pepper, as well plenty of tempting flavors in between: dried apricot-pistachio, toasted almond and candied cherry, fresh ginger, sweet potato-pecan. Each one sounded better than the last to me, but obviously I couldn’t just rely on David’s good name to know if these ice creams were really as good as they sounded, so I selflessly shouldered the burden of making – and tasting – one for myself (the things I do for you, dear readers!). You can read my notes on the recipe I made below, but suffice it to say that the first thing I did after picking myself off the floor was to make a second batch. After that, I asked David if he would mind chatting a bit about the book and his passion for ice cream, to which he graciously agreed. So, first things first. David, this book is beyond fabulous (and I’m not just saying that because ice cream occupies such a gigantic, out-of-proportion place in my heart). There are plenty of ice cream books cluttering bookshelves out there already but this one is truly in a league of its own on every count: quality, scope, creativity, aesthetic value, etc. So tell me, why a book about ice cream? Was it an idea you were nurturing for a long time? When I started teaching classes, I often included an ice cream or two, since ice cream is so good alongside cakes, pies, and crisps, and to show how simple it was. And everyone loves ice cream. And people who read my blog know what a people-pleaser I am! Interesting to me was that the more home cooks I met, the more I found out that lots of people are making ice cream at home, which coincided with something else happening: Ice cream makers got very affordable. Now they’re one of the most popular of all kitchen appliances. But curiously, there’s wasn’t a hardcover ice cream book written by a professional but full of recipes simple enough for the home cook. I wanted my book to include the basics, variations on the basics, plus sherbets, sorbets, granitas, and all the other stuff like sauces, mix-ins, swirls, and toppings. My book uses all ‘regular’ ingredients that anyone can get at the supermarket. But my recipes transform them into something really special, and far better than anything you can buy since you make it yourself. My previous books all included recipes for ice cream and sorbets. But I had so many ideas that I felt the time was ripe for them to star in a book of their own. Tell us amateurs about the book-writing process. How did you move from inspiration to finished product, and how long did the whole odyssey take? From proposal to movie rights and casting, it takes about three years. But basically, it’s important to let the publisher know who you are, who’s going to buy the book, and how you’re going to tackle the subject. Where is the market? Unless you have a nice, perky rack or can smile non-stop while making dinner in 30-minutes or less, bookstores can be cold, cruel places for cookbooks. So I try to find a niche, then fill it. Just writing a book “full of great recipes” isn’t enough anymore. The Perfect Scoop took a total of 2 1/2 years from start to finish. I spent a good, full-year and a half of avoiding friends, writing headnotes, and testing recipes before the photos were done and got a bound-galley, a proof of the actual book. Ten Speed really raced the book out in time for spring, and I’m glad they did. Everyone seems to be happy about it. Especially me. Even though this is my fourth book, when I opened the box and saw it for the first time, it was so great to see all my work paid off. How many times did you test each recipe on average? Did you do all the testing yourself? I would say each recipe got tested an average of 3-6 times. Sometimes I hit it right the first time, and others were more difficult. A few I couldn’t get and some I re-tested since I liked them so much! I’m basically a bit crazy, somewhat of a perfectionist (my blog notwithstanding…), but I also believe in making things foolproof so even if someone goofs a bit, it’ll still taste great. I probably put more into my recipes than others do just to make sure. I also had a small team of testers who I’d send recipes to and they’d write back with comments and sometimes photos. A few of them were bloggers who I met; it was a lot of fun meeting and working with them. I loved reading about your first summer job scooping ice cream, since that’s exactly how I got my start in the working world too. When I was sixteen I had a summer job at a now-defunct ice cream parlour in the small town where my parents live. I actually almost got fired the first day for showing up in tie-dye pants; it turned out the owner was trying to keep the whole place full of good Christian values, which unbeknownst to me are deeply threatened by tie-dye. At any rate, he let me stay as long as I promised to never wear them again, and I spent three glorious months sticking my elbows in ice cream every day. The point I’m eventually getting to is that despite living, breathing and eating ice cream all day every day, I never got sick of it. Did you at any point during the writing of this book? I didn’t realize tie-dyed clothes were anti-Christian either. But the fashion police probably would have got you if the owner hadn’t. So maybe he actually was your savior. as freezer-space since I was making lots and lots every day. It got so bad that I had to start flushing ice cream down the toilet! People would say they’d come over and get it. But then they’d call at the last minute, and have to postpone coming by. Or they’d arrive and start complaining about their diets. Meanwhile my freezer door was groaning and I was barely able to close it, and I’ve got four new batches ready to churn and everything’s at a standstill. And I’ve got a deadline coming. I think that day it was Mint Chip. The photographs are really beautiful, kudos to Lara Hata. I know how difficult shooting ice cream is! Were you involved in their production? This was the first time I wasn’t on set and doing my own food styling. Since I live so far away, and no longer have a kitchen in San Francisco to use, we hired Lara Hata, who’s great. And just as important, we had a fabulous food stylist on the team, George Dolese. He’s done lots of books, including many in the Williams-Sonoma series. Ice cream is very tricky and doesn’t wait to be coaxed into position like, say…a salad or bowl of fruit. So all the shots were done in his kitchen and at the end of each day of shooting, they’d send me pictures to look at and comment on. I also gave them lots of guidance for how I wanted the book to look and feel. They listened, then added their own expertise. They did a great job and really complimented the recipes, didn’t they? As a kid, the only flavor of ice cream I absolutely couldn’t stomach was rum raisin. I’ve probably gotten over that now, but can’t know for sure since that flavor seems to be in pretty short supply these days. Is there any flavor of ice cream you can’t stand? I can’t stand licorice. Anything with licorice tastes like burnt shoe leather. Are you more a fan of ‘pure’ ice cream flavors, or do you like lots of crunchy, gooey add-ins? I know I should say, “Of course I prefer ‘pure, unadulterated’ ice cream.” But I can’t. I must admit that I’m crazy for anything big, crunchy, nutty, chocolaty, or gooey that gets folded into ice cream. Although I probably shouldn’t admit this either, when I was a kid (so maybe the statue of limitations has run out) my all-time favorite pastime was going to Baskin-Robbins and trying to decide which of all those wacky flavors I wanted to try. Invariably I chose the one with the most looping swirls of chocolate and biggest chunks of toasted nuts. I wanted to make sure The Perfect Scoop had a lot of mix-ins and swirls included so people could customize their own ice creams. Although there’s a few hundred recipes in the book, by mixing-and-matching, there’s perhaps thousands of variations. You’re a well-traveled man, having spent a lot of time eating ice cream around the world. Based on your experience, maybe you can clear something up once and for all: what’s really the difference between ice cream and gelato? And was there a reason you didn’t include more gelato recipes in the book? Trying to get Italians to agree on anything is quite a feat, but I did include several fabulous gelato recipes since I wanted readers to get a taste from various cultures. ‘Gelato’ doesn’t really mean anything, except ‘frozen’. So anything can pass for gelato. There, gelato is an art form and I was fortunate to travel around Italy and taste many for myself. Most gelato has little or no cream, and relies on less air for its heavenly richness. Sometimes it’s thickened with starch in regions where eggs are scarce, or the warm climate demands a less-rich base. It’s also held in temperature-controlled freezers so it’s always that perfect, creamy texture. There are so many variations and styles that it’s almost impossible to categorize them. Basically, you could write a whole book about gelato. I was very pleased to see that your publishers agreed to include both metric and American measures. I know this has been a topic of increasing debate in the blogosphere, particularly as our food horizons broaden and recipes are flying back and forth across international borders like never before. In my opinion, American publishers should make it a priority to have recipes in their books accessible to people anywhere (I mean, the best scenario would be for Americans themselves to finally adopt metric, but I’m not holding my breath for that!). Unfortunately, it’s still the rare book that does, and part of that, I suppose, is that testing with both systems is twice as much effort. Did you actually double-test your recipes, or were they just converted on paper? What some readers don’t understand is that sometimes it’s not up to the author. Some decisions are up to the publishers and many would publish a Jewish cookbook by Mel Gibson if it would sell. That said, some people just don’t want to weigh ingredients. But it was a risk I was willing to take since I live in Europe now and with the blog, my audience has gone global. My publisher, Ten Speed Press, is international too; much of their distribution is outside of America, as well as within. But the ultimate decision was up to me. And since I live in France, I thought I’d have more of a global vision for the book. Yes, it was indeed more work: sometimes I felt like I was writing two cookbooks at once. Some of the recipes were easy to convert (you don’t need to keep measuring the same cup of milk over and over again), but in recipes with flour, or other variables, the recipes were tested and re-tested by me in metrics. I had testers both in and outside of the US as well trying both. And last but not least, the million-dollar question. If you were stranded on a desert island with a portable battery-powered freezer only large enough to store one flavor of ice cream, which one would it be? The Mocha Sherbet. It’s full-flavored, frosty-cold, and combines two of my favorite flavors: chocolate and coffee. And since it’s got almost no fat, I wouldn’t have to worry about how I’d look in my swimsuit. Okay, I lied, just one more question. I know this one has barely rolled off the presses, but I’m sure there are millions of people out there dying to know: can you give any hint on what your next book might be about? Melissa, I’ve got a summer of ice cream churning ahead of me. Who’s got time to write? Ever the man of mystery – I guess it’ll just be a surprise! In the meantime, thank you so much for taking the time to chat, and of course, for authoring such a beautiful, mouthwatering book. I suspect the next few months are going to be even more ice cream-intensive than usual around here. I’m admittedly not much of a banana person, but two things never fail to set me salivating: banana ice cream and roasted or caramelized bananas (such as in, for example, the heaven-on-earth known as bananas foster). I had never thought of putting them in one package, however, until I saw David’s recipe. After tasting it, I think I saw stars. I mean, in my book a frozen dessert is already great if it finds a way to combine deeply caramelized bananas, brown sugar and butter, but there are a couple of other things that put this ice cream in a league of its own. One is that it doesn’t have a custard base, which means putting it together is a snap. The other is that it doesn’t actually contain any cream. Just that little bit of butter and some milk – that’s all. But you’d never know it since it tastes as rich and creamy as any super-premium ice cream out there. But don’t take my word for it – go make some yourself! A note on equipment: longtime readers will know that I don’t possess an ice cream maker. Never letting something that trivial stand between me and my dessert of choice, however, I make do without one, though I have found one other kitchen gadget to be incredibly useful in this endeavor. I find that periodically blending the mixture with my handheld (immersion) blender as it freezes results in something almost as creamy as that made with an ice cream maker. It’s still a little icier than optimal, but it sure beats no ice cream. Preheat the oven to 400F/200C. Slice the bananas into 1/2-inch (2-cm) pieces and toss them with the brown sugar and butter in a 2-quart (2-liter) baking dish. Bake for 40 minutes, stirring just once during baking, until the bananas are browned and cooked through. Scrape the bananas and the thick syrup in the dish into a blender or food processor (or a large bowl, if you’re using an immersion blender). Add the milk, granulated sugar, vanilla, lemon juice and salt, and puree until smooth. Chill the mixture thoroughly in the refrigerator, then freeze it in your ice cream mixture according to the manufacturer’s instructions (or freeze in a covered container, blending every couple of hours with an immersion blender until it becomes solid). If the chilled mixture is too thick to pour into your machine, whisking will thin it out. David suggests using this ice cream as the basis for a banana split; I think it would take beautifully to some add-ins, such as some chocolate chunks and toasted walnuts or pecans à la Chunky Monkey, a swirl of dulce de leche, or even a bit of cinnamon, nutmeg and rum to evoke the flavor of my beloved bananas foster. Melissa — thanks for the fun interview. Thanks even more for the recipe. A new scoop shop called Bi-Rite Creamery opened in SF a few months back, and on our first visit I went right for the salted caramel while J. ordered roasted banana. I felt quite confident in my choice — smug, in fact — until I had a taste of his. Oh. My. God. I had my very own When Harry Met Sally moment and someone in line asked what we were eating. Then they ordered it. If David’s winning personality weren’t enough, this one recipe would be reason enough to buy the book! That’s a great interview – and the recipe looks amazing. Luckily I have all of those ingredients right at home, so guess what I’ll be making this weekend? Yeay! This is a book I definitely must get! oh.. mmm..(licks chops) I love bananas.. raw, roasted or otherwise..This recipe makes me want to rush out and buy an ice cream maker. It might be a bad thing for the waistline, but totally worth it I bet. Cute interview by the way! Thanks for the entertaining interview – but now I’m even less able to decide which of his four books I should finally buy… Can’t wait to hear more about Morrocan food! wow that ice cream looks amazing. i’ve only had banana ice cream once and i was blown away the first time. i can’t wait to make it myself. thanks! Melissa: You are totally scoop-endous! Thanks for the fabulous chat. But I wish you had an ice cream maker. I wonder if there’s a way we, your die-hard fans who love you and give thanks daily for your fabu site and stories, can take up a collection and get you the ic attachment for your KitchenAid mixer? Maybe set up a PayPal tip jar and all of us who love and enjoy your prose and photos can contribute? If so, I’m totally in. Let’s do it! Hi Melissa! Thanks for the great interview with David. I’m looking forward to getting a copy of his book and whipping my ice-cream maker (or immersion blender – great idea!) back into shape. hi mel,oh, i love that photo! is the bowl a treasure from morocco? u know what, nash got an icecream maker a few days ago so i will now kindly ask him to make the icecream of ur choice, which sounds delicious. n getting that book might be a good idea also…i m waiting for more interviews, that one was fun. YAY! My 2 favorite people together at last! What an amazing interview, even if your subject is quiet and kind of shy and doesn’t say a whole lot. (kidding, mr. l! )This was absolutely fantastic! dear melissa, how you tease your devoted readers holding back on all the no-doubt luscious details on the food you enjoyed on your recent trip 😉 but of course, getting an insight into what is probably one of the most exciting ice-cream books to be recently published is hardly a poor consolation prize! Your ice cream looks incredible. I once made banana ice cream trying to capture the banana frozen custard I loved as a kid, but the result was disappointing. Just by looking at your ice cream, it looks like it would fit the bill! Oh, I am so making that ice cream. Thanks for the interview and recipe. Thanks for the tip about using a handheld blender–I never thought about that! Interesting interview, but what really caught my eye was the recipe. I, too, am not big on bananas, but roasted? That does sound wonderful. And tempting.Cheers! I’ve nominated you for a Thinking Blogger award.Thanks for the always-inspiring writing & photography! I,on the other hand, adore bananas most any way. Can’t wait to try this, and will be doing so very soon…because, lucky for me, my fridge with the inadequate freezer has at last been replaced by my landlord. So now, it is cold enough to properly freeze the cannister of my cheapo ice cream maker. I’ve already been going crazy with it, and will obviously need this book, despite my oft-cited lack of shelf space. Excellent interview! I’m a little late to the party and haven’t understood until very recently how funny and crass David can be. I laughed for a long time at: "Unless you have a nice, perky rack or can smile non-stop while making dinner in 30-minutes or less …." Thanks for the interview. that was a really entertaining interview! and who knew that even cookbook writers can’t make the perfect dish in just a couple of tries! holy cowaroly… I am going to MAKE that icecream and then buy the book. This is my first visit to your blog and what a post to land on! Thank you for the great interview! Ever tried to fry this ice cream? Wonder how that would taste. I’m def getting this BOOK! I’ve got the banana mixture chilling in the fridge right now. My mixture is much darker than your picture and when I scooped the bananas into the blender the sugar mixture became very hard. I heated up the milk to try to get it syrupy again. Did this happen to you? The mixture tastes delcious nevertheless. For some reason it tastes sort of like pears and I am already imagining roasted pear ice cream. I toyed with using basalmic vinegar instead of lemon juice. Lynn – I think I was using room-temperature milk, so it didn’t seize up on me – but I would have done exactly what you did if it had. How did the finished product turn out? p.s. 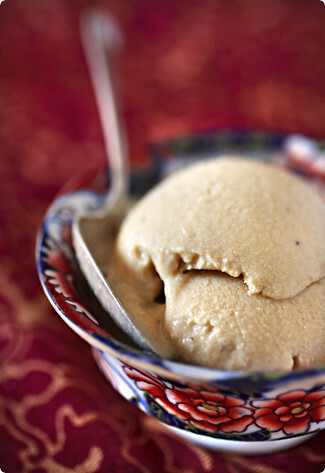 speaking of pears, there’s an amazing-looking recipe for pear-caramel ice cream in the book! It was absolutely to die for, but very dark, like dark chocolate ice cream. I think maybe my oven runs too hot. I might try this again roasting only two banana and leaving the third uncooked to sort of spike up the banana taste. This recipe just opens up lots of possibilities. I served this over the wkend & the consensus was unanimous: it’s a winner! The flavour was very deep & rich & extremely ‘banana-ish’.One of the guests suggested possibly adding a shot of rum to the mix next time. Great interview! 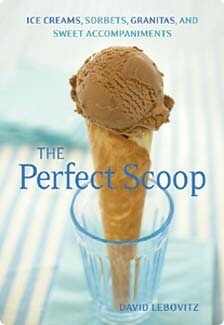 I’ve got the canister of my ice cream maker waiting in the freezer, and now I’m off to buy the book! Do you think you could post the recipe for mocha sherbet he reccommended as his very favorits recipe?